Astronaut David Scott is carefully adjusting the high gain antenna on his lunar roving vehicle, the LRV. Accurately pointing the antenna to Earth wasn't hard by any means but he had to be precise so it took a little time. 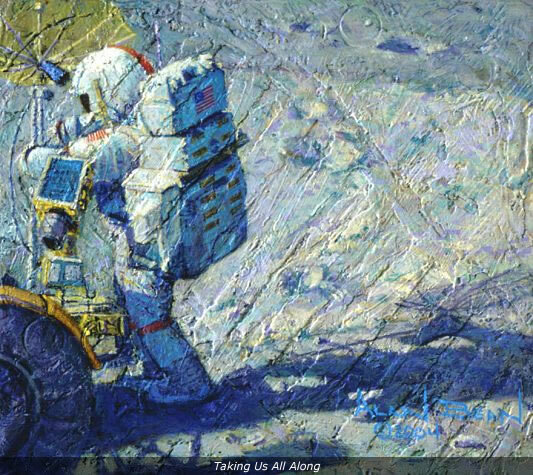 His Apollo 15 mission will be the first to be equipped with a LRV and it will allow him and his sidekick Jim Irwin to be much more effective on the Moon than we astronauts were on the previous three missions. Dave and Jim would have their electric car to move between sites of interest while we earlier explorers had only our leg power. But this vastly increased mobility was not the most far reaching change that occurred on Apollo 15: it was the television camera. For the first time we had a color television camera that was completely controllable from Earth. A flight controller could point the camera and look and listen wherever the engineers and scientists needed. Think about it. When Ferdinand Magellan sailed with five ships and 270 men in 1519 no one in europe knew what was happening on his voyage until one ship with 18 men returned. That was almost three years later with the news that they had made all the way around the Earth. Now for the first time in history, all the interested humans on Earth can go along with their explorers, experience what they experience, see what they see, and discover what they discover in real time. Even Christopher Columbus had to wait seven months to tell of his voyage and discoveries.